REACH Magazine, in partnership with selected Robinson's Malls is holding Summer REACH-Out 2015, an event-for-a-cause, starting mid-April until the end of May, aimed at enabling less fortunate yet smart and driven children ages 7 to 19 years old to discover and enhance new talents and skills. Indicate your name, your age, the workshop you want to attend, your mobile phone contact number, and the Robinson's Mall location you want to go to. Or email us at reachevents.ador@gmail.com for any clarification or inquiry. 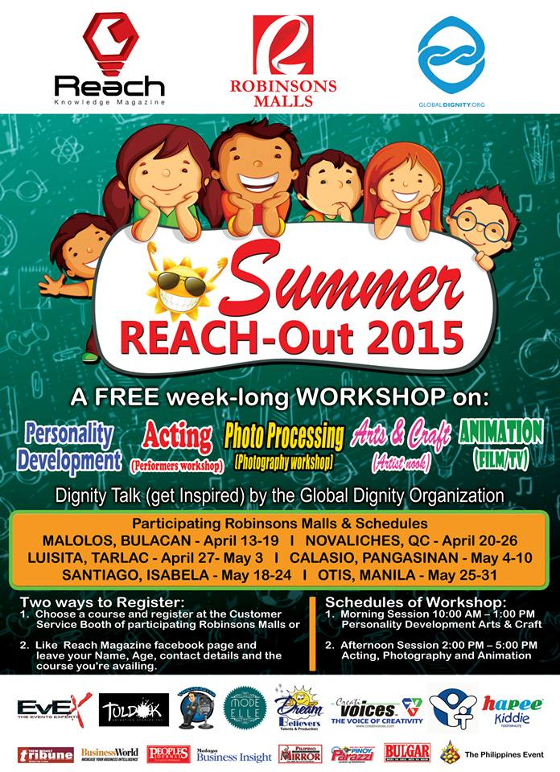 See you at the Summer Reach-Out 2015 Free Workshops!